Jonathan Rea at Magny-Cours in France on Friday. Jonathan Rea says he will be prepared for whatever challenges are thrown at him as wet weather threatens to make his job a little bit more tricky in race one in France on Saturday. 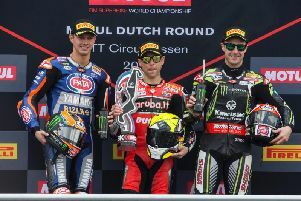 The Kawasaki rider can wrap up a record third successive World Superbike crown and laid down a marker by topping both free practice sessions at Magny-Cours in France on Friday. Rea, who was more than four tenths quicker than PATA Yamaha’s Michael van der Mark on the opening day, was more than happy with how his Ninja NX-10RR was performing in the dry during FP1 and FP2. Saturday’s forecast suggests rain will play a part in race one (12:00 BST), but Rea says he will be ready irrespective of the weather. “We just put the package together today and the bike is working really well. I am just trying to understand which one of all the tyre options that Pirelli have brought here to use for tomorrow,” said the 30-year-old. “I think we have a good idea of that already. I am feeling good for long distance and for a one-lap attack. Whatever happens with the weather tomorrow we have to be ready because it is the first opportunity we can have to win this championship. Rea is 120 points ahead of his team-mate Tom Sykes, who is back from injury after missing both races in Portugal. Sykes, who sustained finger and hand injuries at Portimao, was tenth fastest on Friday and has secured his place in Superpole 2 on Saturday.